Are you having trouble finding the time to market your music on social media? Don’t forget; we all have the same 24 hours in a day. If it’s important to you, you will find the time to do it. However, if you’ve already dealt with the mindset issues, and you’re still not finding the time – or you’re just looking for ways to be more efficient – here is how you can automate your social media efforts to save time and still stimulate engagement from your fans and followers. Personally, I like to use HootSuite, but there are many tools out there that you can use for free to automate your social posting (keep in mind that most of them require you to upgrade to a paid version to take advantage of all of their features). Buffer, SocialPilot, and Grabinbox are just a few more examples of automation tools. What most of them allow you to do is schedule updates for optimum engagement times, and many of them do this automatically. Of course, you can still schedule your posts for specific times if you need to. What social networks you can connect to largely depends on the tool you’re using, but most of them can handle Facebook, Twitter and LinkedIn at minimum. Once you’ve found your tool of choice, it’s time to craft your social updates. In general, the thing to avoid here is to write generic “check this out” or “check that out” kind of updates. You can use call to actions, and it’s a good idea to do so, but maybe limit them to one or two in every 10. The idea here is to engage your audience, so you shouldn’t be asking them to buy something or do something every time you post. Most automation tools have link shortening built in, helping you to save on characters in your updates. Get creative with your updates. Just because they’re scheduled doesn’t mean that you can’t use them for outreach or ongoing conversations. Hey @Dawmusic. Nice to meet you. I liked your article about social media. Do you have any marketing tips for a metal band? Building your connections and nurturing your friendships is incredibly important, so it’s good to know that you can do this even if you are automating. When scheduling your updates, the auto-schedule function (or similar) should be your go-to option. If you absolutely need to schedule updates for specific times, it’s nice to know that you have that option, but it can slow you down. Want more control over when your updates go out? 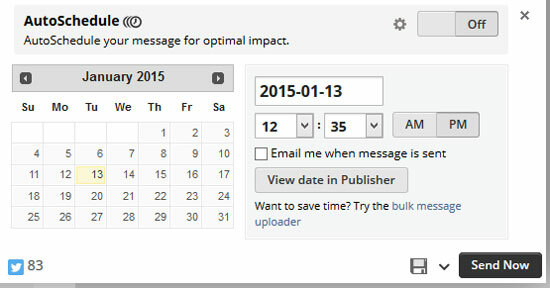 Most tools let you pick a specific time and date to send individual posts. Additionally, you should consider batching the scheduling of your messages; maybe set aside an hour or two once per week or once every month. That way, you can have it done and not have to come back to it until later. A good practice is to have five to six messages ready per day, as some of the tools mentioned will automatically allocate that number of posts on any given day. Also keep in mind that you have a character limit; especially on Twitter. Facebook and LinkedIn tend to have fewer restrictions, but you shouldn’t necessarily cross-post all of your posts, because every social site tends to have its own post formatting conventions. Not to worry; you can schedule posts for individual social networks to tailor them to these formatting conventions. Obviously, this will be a little more work, but if you’re only focused on two or three sites, it shouldn’t be too intensive. 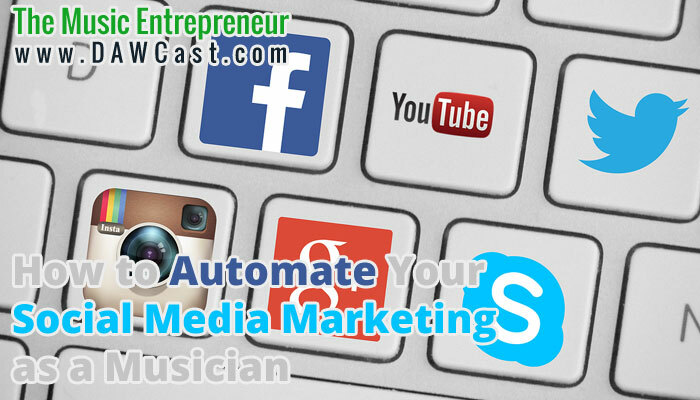 With the use of automation tools, you can do a lot of your social media marketing in one fell swoop. Of course, you need to recognize that this is an ongoing task, and will require maintenance from time to time. You will need to craft more messages and go into your tool to schedule them periodically. Keep in mind that you can still be spontaneous on social media, and manually post new things as ideas come to you. 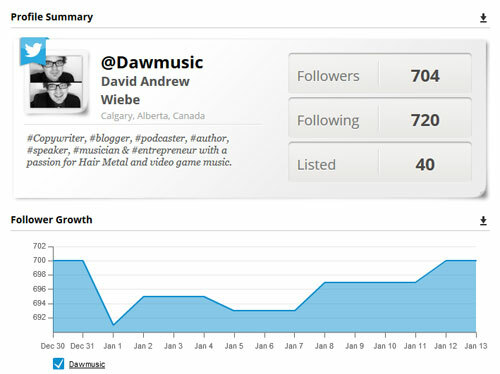 Some tools also have built-in analytics that will allow you to track how your posts are engaging. This is great news, because you can take a look at what’s working for you and do more of that. Stats are always nice to have, especially when you’re trying to figure out what posts of yours are engaging best. These days, most social media sites do offer you in-depth engagement data, but if you want to manage it from one place, automation tools can make this entire process streamlined. Automation isn’t everything. It’s great, and it can make your life easier and save you some time, but it doesn’t guarantee more engagement or better results. Posting manually to your social profiles tends to do better in search, and also looks more authentic to your followers unless you do a particularly great job at step 2. Noting that, I think it’s important for musicians to curtail feelings of overwhelm and begin to feel like they can get on top of things and stay there. From that perspective, automation tools may be a necessity. Are there any productivity hacks that you use in your social media marketing efforts? Are there any other tools that you like to use?